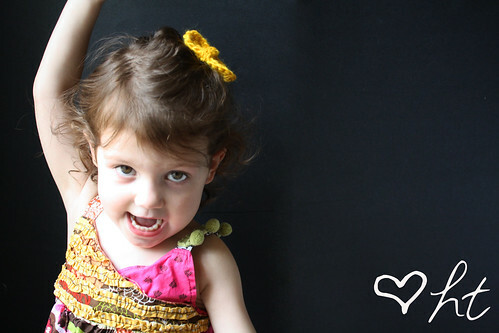 Now that you have had to endure all those pictures, it’s time for the tutorial! This isn’t specific, just a basic how to. You can make them however big or little you like. 1. Start by making a chain. 2. Then sc in 2nd ch from hook and sc across. 3. Then turn and create the next row on top with sc stitches. Make as many rows as you like. 4. Once you are done with the last row, start to sc around the whole rectangle, except for the top row you just did. This cleans up the edges. 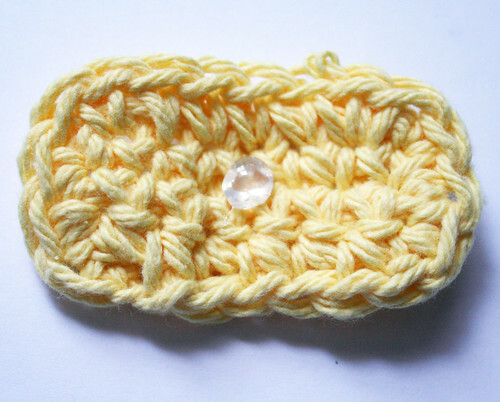 I also try to crochet over the beginning strand of yarn that is left. 5. 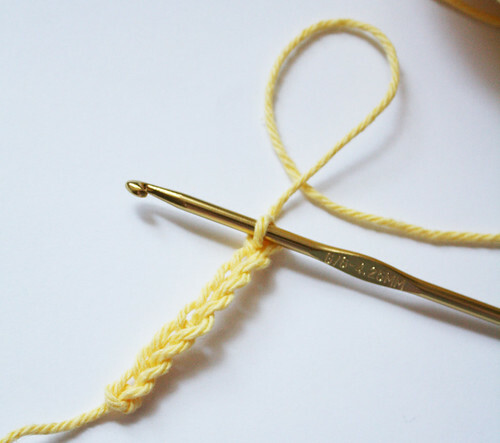 Then take your yarn needle and thread in the end(s). 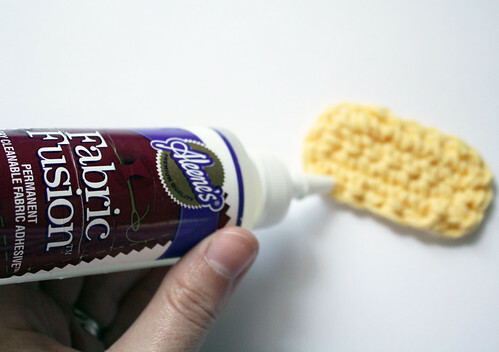 Make sure the ends are coming out of the back of the rectangle as you will then cut them and dab a little bit of fabric glue over them. 6. Create the middle piece the same way as in steps 1-2. Make it long enough to go around the rectangle to glue. Then tie the ends together and trim excess yarn. 7. Dab a dot of glue from your hot glue gun on the middle front large rectangle. 8. Quickly place the middle piece on it, making sure the middle is on the glue. 9. Then turn over and do a dab of hot glue on the middle back and quickly pull over the front piece and hold in place until dry. 10. Repeat for the other side, but this side will lie on top of the other end of the middle piece. And there’s your bow. So nice and cute. If you like, you can glue on a hair clip or whatever. One is perfect to hold side hair back. 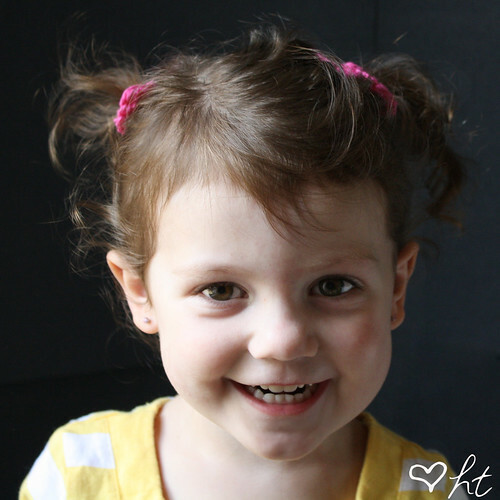 Or add two onto ponytails! You can find these available in the shop. I will be posting all of them throughout the next two weeks. cuuute! they remind me of Hello Kitty. was just thinking the same thing, my daughter is obsessed with HK. Perfect way to use up left over yarn. Adorable! Looking through my yarn stash to see how many different colors I can make! 🙂 What size hook did you use for your bows? Thanks! oh jessica, i love love LOVE this! this is the kind of crocheting project I can handle! Darling pictures and great idea. i’ve actually been wanting to make some of these! thanks for the tutorial! they’re so stinking cute! LOVE these, wish my “little girl” would let me put them in her hair like she used to. I might make them for my grand nieces instead…thanks for the great tut! I used a size g hook. 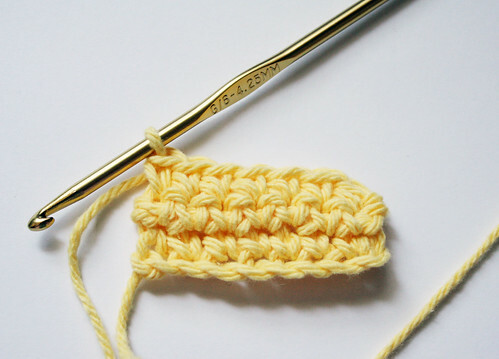 I can’t crochet so I am not interested in the tutorial but I adore the pictures – how cute!! ADORABLE! My girl is going to love these! Thanks for the tut! 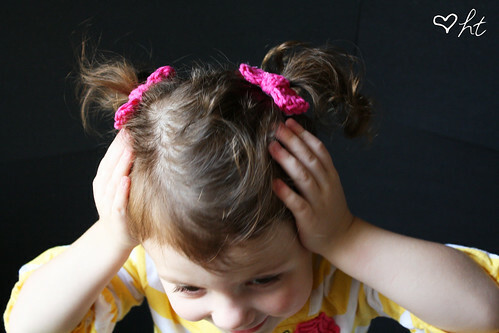 How adorable, I love hair bows for my daughters. I think I will pull out some yarn and make some right now. Those are adorable great job I featured them you can check them out and grab a button if you’d like. 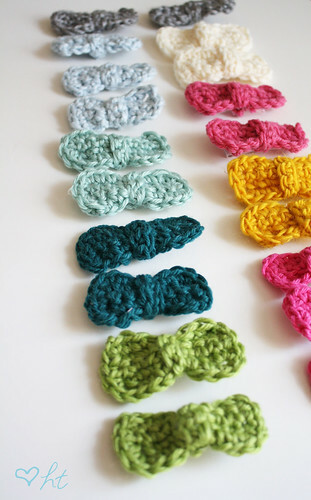 Geez, these are so stinking cute I might have to go to the craft store tomorrow for ribbon to make them! 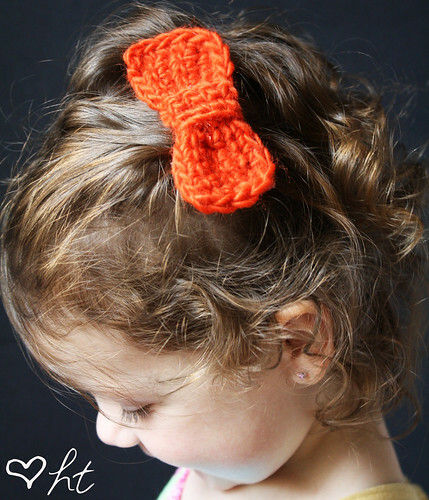 LOVE the crochet hair bows! 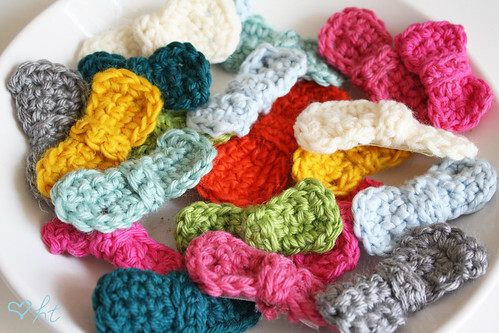 I am so into crochet right now, I have to fit these in somewhere! too cute!!! can you be more specific about how many there are in the chain? As for how many to chain, I usually did 9. But the size of yarn and hook will determine how long that really makes them. The longer you make it the bigger it will be the the shorter it is the smaller it will be. I suggest playing around with it a bit until it is a size you like. Where can I find the ribbon covered clips? I’ve not seen these yet. I made the clip myself by hot gluing ribbon on alligator clips which you can buy at the craft store. People on Etsy sell plain ribbon covered clips too. Hey Jessica! Just dropping in via 30 Days. Your Peanut Butter Pie looks yummy as yummy can be :o) I’ll have to try it. You are so talented! I love these little bows! They are so precious! I’d love to learn how to crochet. You can make the prettiest things with it. I did learn to knit but I had to have someone there showing me how. Well, just wanted to say hi and I look forward to following! Cute cute cute! 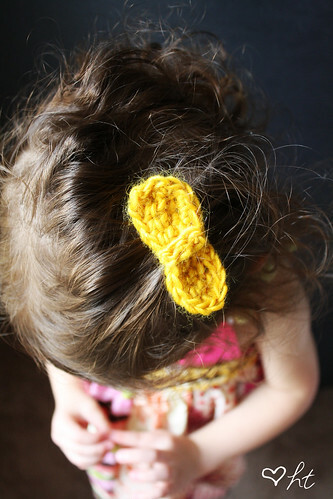 I love them….I know some little girls to make these for! I really like to crochet and I haven’t for a while. I will have to try this! I love the pictures by the way. You are so creative with presentation. The black background adds a professional quality and brings out the colors in the picture so nicely. Well done. oh my goodness…these are the cutest! 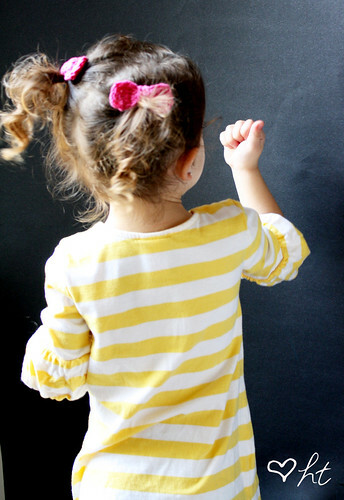 I am so glad they are in your shop…I will be buying some of these for my girls in the next week or 2. I just found your blog tonight via 30 days. I love it & I am your newest follower! Can’t wait to read more! cute!! 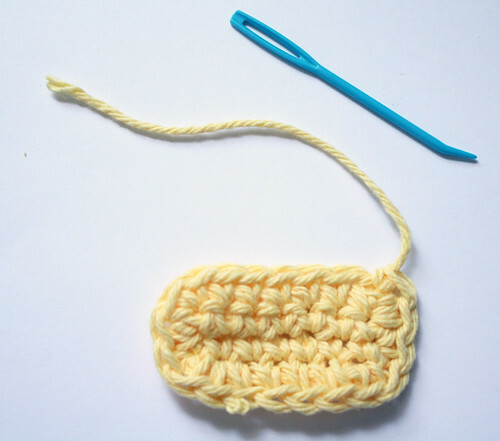 hmm i know how to knit but never attempted crocheting….i shall try! These are so cute!! I love them all!! Thank you so much for sharing this tutorial! I’ve always wanted to know how, but i thought that they would be too difficult to make. These are great! And easy, too. Thanks for the tutorial. so cool!!! 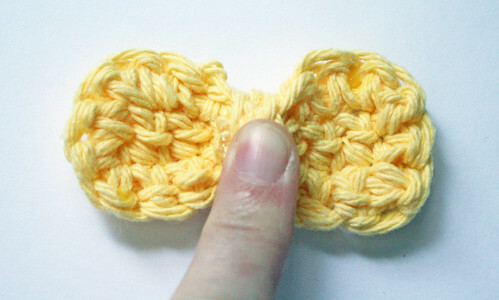 wish i knew how to crochet..
simple and cute. i love them. This is such a cute idea. I love the yarn you used, so many pretty colors. Can you share what brand you used? Thanks so much. I used scraps, so it’s all kinds of brands! Most are from Lionbrand and Lily Sugar and Cream. You can really use anything. 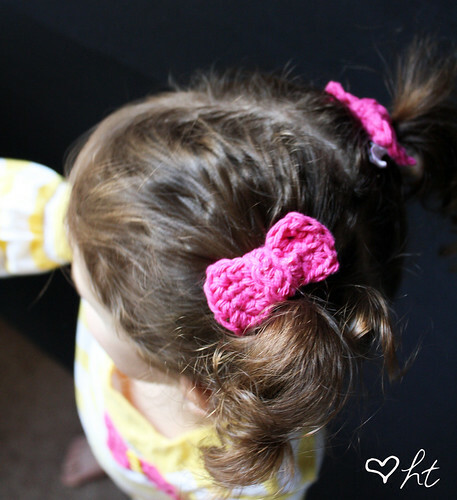 You could even cut really thin strips from t-shirts and crochet that into bows! I just wanted to thank you for this post/tutorial. 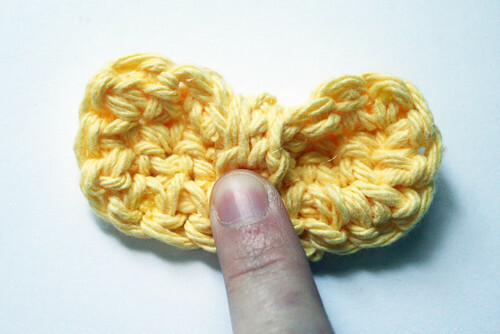 I made a baby headband using your general technique of making a rectangle and another rectangle to pinch it into a bow. I made it out of fabric since I am helpless with a crochet hook, but your post was the inspiration. It turned out really cute. I forgot to take a photo of it… Anyway, thanks! Thanks again for the fabulous idea! Clever girl! I love these and will definitely (hopefully) be whipping up a slew of them for Samster’s fall wardrobe. 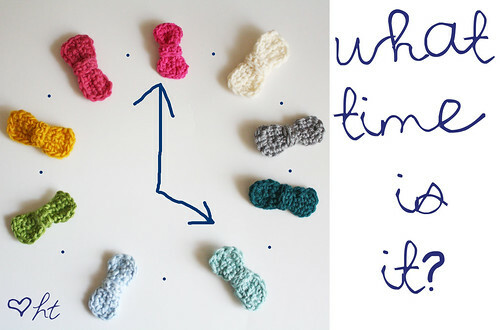 Whoahh… How I wish I know how to do a crochet. 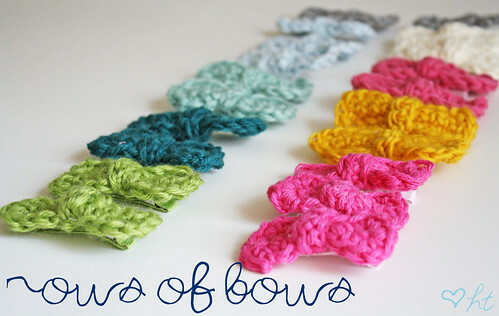 I would also love to try to make that lovely hair bows. these are perfect! 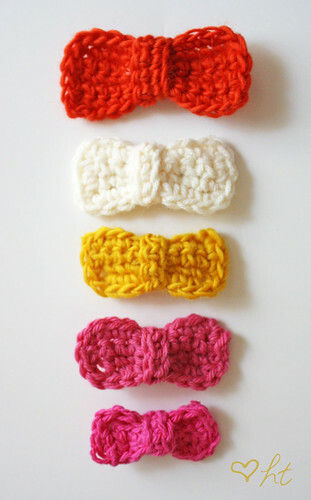 I may be an adult, but I want some crochet bows for my hair. perfect project to do with my mom over Thanksgiving weekend! Morning! I just wanted to let you know that I have featured your tutorial on Cuteable this morning and that I found you via Whip Up. I love these bows! So quick and easy! I found them via Tangled Happy. I’ll be making many more! Got to go plug in my glue gun! 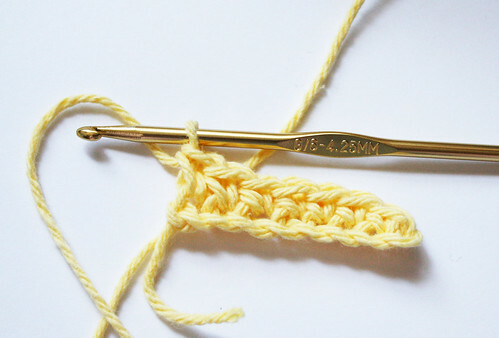 What size crochet hook did you use? Love the bows. I love this tutorial! As soon as I found it, I ran and made my baby girl a Hokie hair bow for the game this weekend. 🙂 Thank so much for sharing! I just made my first one of these! (I used size I hook.) Thank you for the tutorial! I definitely need to invest in a hot glue gun! I love the simplicity of these. I can crochet but not real good at following a pattern so this is perfect! 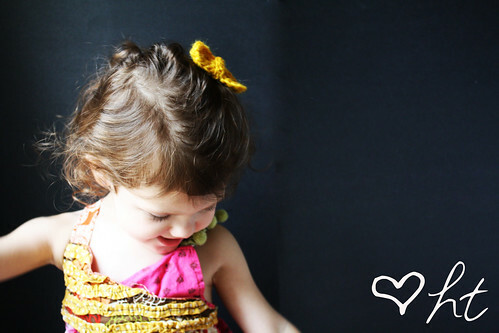 you can make your own ribbon covered clips by measuring the ribbon against the clip and adding some hot glue. easy as chocolate cream pie!!! I am so excited to find your pattern for these bows; I have two great granddaughters (one is just two weeks old) the other one is four & one half. 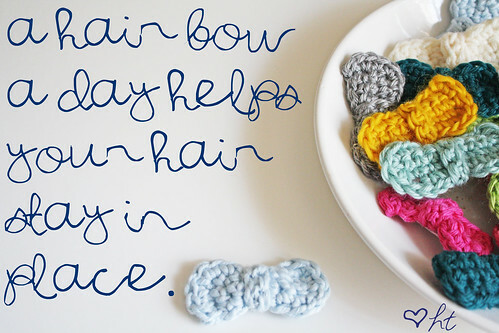 I have been crocheting for them almost constantly so I will be doing these also! Thanks they are so cute! These are adorable! I’d like to make some for my granddaughters but I can’t figure out what step #10 means. Can you explain? Thanks! 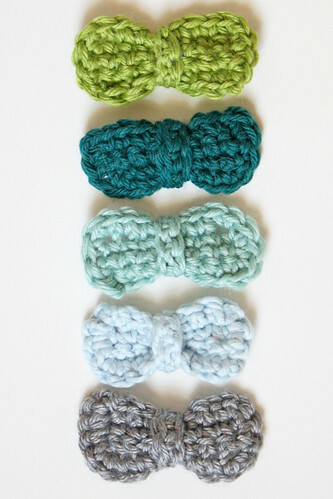 Can’t wait to ATTEMPT these I’m not a great crocheter but I’ll try! These are so cute. I’m new to crocheting. Can you please tell me what the abbreviations mean and what kind of yarn you used and where you purchased it from? Thank you 🙂 As for the yarn, I used all kinds from my stash for these bows. I buy yarns from stores like Michael’s and Hobby Lobby. 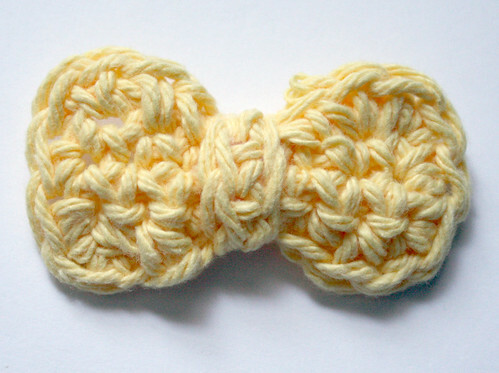 My favorite to use for these bows is the Lily Sugar n’ Cream brand (the yellow I’m using in the tutorial is that kind). 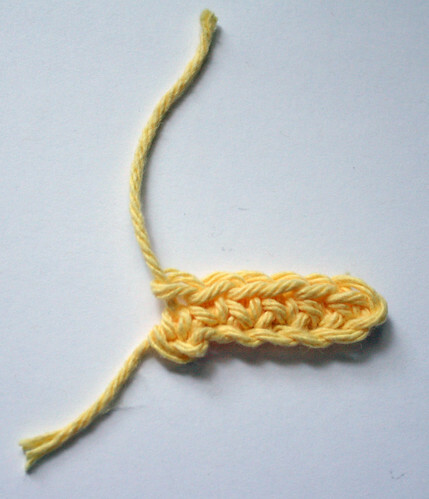 For abbreviations, sc is single crochet and ch is chain. 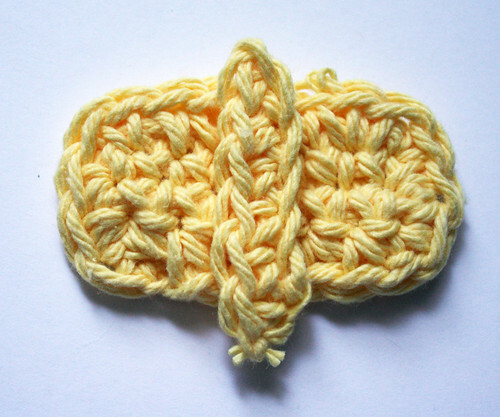 If you even see an abbreviation you are not sure of, just do an internet search like “sc crochet abbreviation” and you will find a quick answer. Also note, that different countries do use different abbreviations. 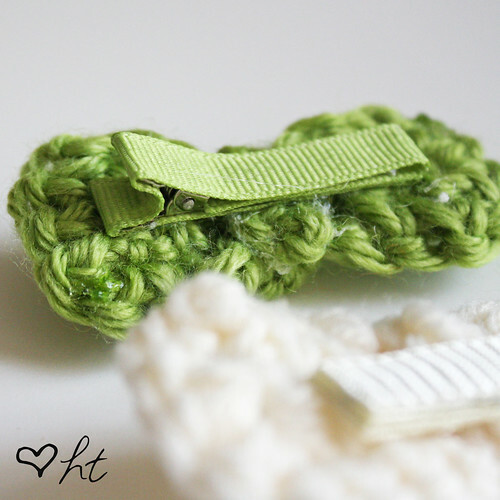 I used American crochet terms for this tutorial. These are so pretty and I love the colors. So I tried it and mine come out with a lot of holes or open spaces whereas yours look pretty tight. Am I doing something wrong? My granddaughter sent me a picture of these some time ago and wanted to know if I could make her two daughters some. So now I can. thank you so much for the instructions.